This is a double homage to Robert Louis Stevenson’s Kidnapped and to David Balfour or Catriona, the alternate titles of its sequel. It is a follow-on to 504. Homage to Robert Louis Stevenson. Kidnapped was published 132 years ago, so there are bound to be some problems with language and culture. If it were being read by adults familiar with how historical novels function, there would be no issue, but Kidnapped is seen as a boy’s book. It isn’t. Kidnapped is a Bildungsroman, a coming of age novel in which the main character faces moral choices. Kidnapped and Treasue Island are often lumped together, but they are quite separate species. Consequently, Kidnapped does not get the respect it deserves. David Balfour is off to seek his fortune, shortly after his father’s death. He is going to see a rich Uncle Ebenezer, without knowing that he has a claim on his uncle’s fortune. At his uncle’s connivance, he is kidnapped onto the brig Covenant and shipped off to the America’s as a slave. Complications ensue. David falls in with Alan Breck, the Covenant is wrecked off the west coast of Scotland, and David and Alan find their way back to Edinburgh. Along the way, they witness the murder of Colin Roy Campbell, a matter of great political importance in the days shortly after the Jacobite uprising. Alan Breck Stewart, which is the full name of David’s companion, was based on the real historical character who was implicated for the murder (also real), tried in absentia, and sentenced to death. The sentence was never carried out and the real Alan disappeared from history, leaving a trail of local stories about what happened to him. RLS took the Appin murder, as the incident was called, as the backbone of his story, not only in Kidnapped, but also in its sequel. There is plenty of adventure, danger, and intrigue to carry the novel to its conclusion, but its quality lies in the view David gets of both sides of the recent war, and the moral decisions he constantly faces. David is a lowlander, a conservative, and a supporter of King George II; his companion Alan is in rebellion, on the run, and collecting rents which will go to support his King, Charles Edward Stuart. Patriotism would have David turn Alan in; their friendship, and the fact that each has saved the other’s life during their journey, will not allow him to do so. David knows that Alan is innocent of the murder, but he can’t testify to this without revealing that Alan is a traitor in the eyes of the British and already condemned, while throwing away his own future for consorting with King George’s enemies. At the end of Kidnapped, David overcomes his uncle, then shows him mercy, gains his proper inheritance, and is in the process of helping Alan escape to France. As many critics have pointed out, the novel ends short of completion, with Alan still waiting for passage and James of the Glens was still in jail awaiting trial for a murder he did not commit. RLS himself admits this and hoped to make things right if Kidnapped were successful. I would give it to you in his words, but I haven’t been able to find the quotation. It comes of reading too many books in a lifetime, and not being organized enough to write down every quote I like. 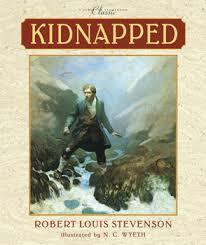 Kidnapped was successful, and he did write a sequel, called Catriona in Britain and David Balfour in the US. The sequel never got the acclaim of Kidnapped. I find that unacceptable, so stay tuned for a look at Catriona on Thursday. Kidnapped is not on the list for The Great American Read, as I discussed a week ago. The fans of Kidnapping — they are legion — have arranged a walking trail in Scotland that follows David’s path from the shipwreck to Edinburgh. You can find information here. I’ve added it to my bucket list. This entry was posted in A Writing Life and tagged history, language, literature, politics, review, writing on July 23, 2018 by sydlogsdon.